Before you ride know your limitations. Consider your skill, fitness level and gear that can influence your ride. You should know and understand the language of the park, what the signs mean and the different trail designations. Beginner – This trail designation includes gentle climbs and descents with rougher single track trails and obstacles such as small rocks, bridges, pot-holes, tree roots, berms, or other natural or built obstacles. The beginner trail is designed for the new Bike Park rider. Intermediate – This trail designation is more difficult. These trails offer challenging riding with tighter corners, steeper slopes including large natural and built obstacles, loose trail surfaces, roots and rocks, jumps, ramps, elevated features, berms and drops. The Intermediate trail designation requires previous off-road riding experience. Advanced – This trail designation is most difficult. These trails feature long steep grades with large technical features, including rocks, roots and drops, loose trail sections, numerous natural and manmade obstacles. Advanced trails also include jumps, ramps, elevated features, berms, drops, slab rocks, rocks or other terrain variations. Technical handling through tight trees and rough sections is required. Advanced trails are suited for riders who have mastered all of the intermediate trails. 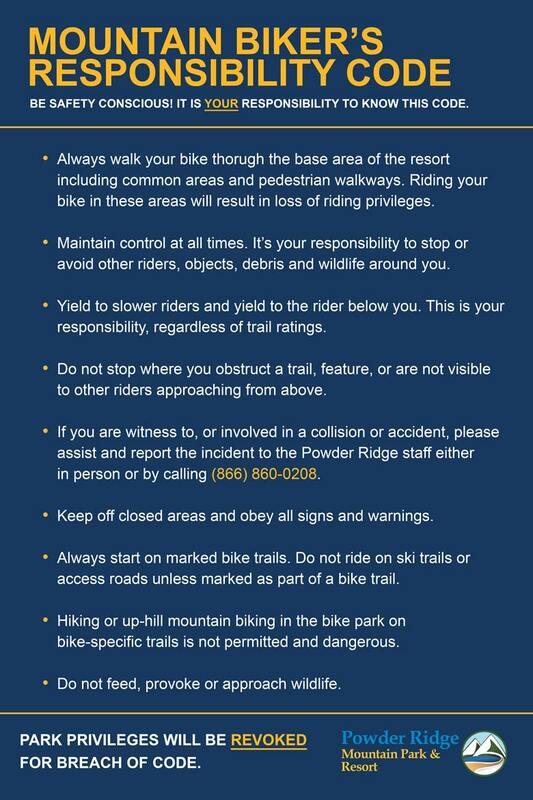 Riding is allowed only on designated trails and all riders must strictly adhere to the rules of the mountain. Some trails may be closed. Observe all signs and warnings; they are in place for your safety. Do not stop where you obstruct a trail or cannot be seen by other mountain users. Alcoholic beverages are prohibited on the mountain. Please, pack out everything you brought with you and do not litter.